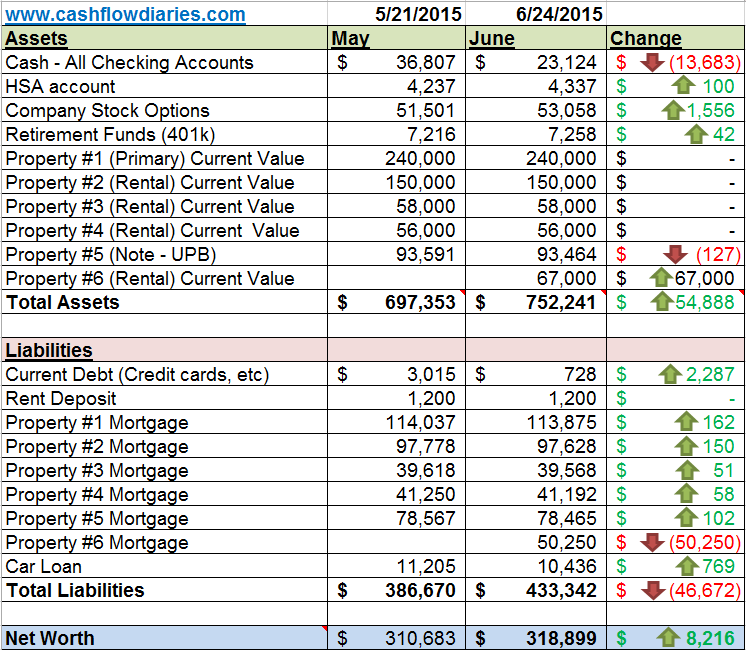 This is my official Net Worth Update for June 2015. Below are my actual numbers for ALL my investments and liabilities as of today. Explanations and quick summary below chart. Oh yeah!! My net worth grew by $8216. I was really surprised to see it went up that much because I used a bunch of cash to pay for closing costs on the new rental and I also bought plane tickets for two up coming vacations later this year. The reason why it went up like that though is because I’m starting to get back some payments from a loan I lent out to my girlfriend. I know! You may be thinking this is a bad idea but I took full control of her finances and set this up on purpose so she can stop paying 15% plus on BS interest. Now she has zero interest on her small debt and it should be completely paid off in just a few short months. I also received first month’s rent on the new rental property and I don’t even start paying that mortgage until August 1st. So for a few months (June and July), I get to see EXTRA cash flow from the new rental. This was a pleasant surprise and I’m really happy with that boost. This constitutes two different checking accounts. My normal checking account and my REI (Real Estate Investing) checking account. My cash took a significant hit because I used a bunch to pay for the down payment and closing costs of the new rental and I also booked a few trips for later this year. Satisfied! My HSA deductible is $1300 for the year so with that being said I am only taking a very small amount out from my dreadful day job paycheck to fund this account. Any money after that deductible will just sit in that account not making me money. I know I can use the money that I don’t put in there to get better returns as long as I invest it in more real estate. This number should increase each month a tiny bit. Satisfied! These are stock options from my day job. I am fully vested. This number goes up and down but for the most part has been consistently going up. I’m anticipating on these stocks to continue to grow however its pretty much all speculation. Educated speculation at least. I am not planning on cashing these out unless it’s an emergency situation. Satisfied! I have made an executive decision to no longer contribute any more money to my 401k. Mainly because I do not get matched contributions from the dreadful day job. But also because I KNOW I can make better returns using that money on rental properties. I expect this small investment to gradually grow each month assuming the market doesn’t crash. Satisfied! This is my primary residence. The market I live in is extremely hot and I expect the appreciation on this house to continue to grow. I will only update the market value once a year though with the next time being spring of 2016. I have it listed as a conservative $240k right now based on MLS comparisons in my neighborhood. If I were to sell it I’m pretty sure I could get at least 250k for it but ill stick with 240k for the spreadsheet to be safe. Satisfied! Here are more details on this future investment property. This is my first rental property. It used to be my primary residence. I expect gradual appreciation from this property as well because it is in the suburbs of this HOT market I live in. Love me some HOT markets! 150K is about what its worth now based on MLS comparisons. I will update the market value of this property in the spring of 2016. Rent paid in full and on time. The tenant did however notify me of a broken oven. The oven is 15 years old so Ill be purchasing a new one in the next coming weeks. Need to keep my tenant happy! Satisfied! This is my first turnkey rental property I purchased out of state. I do not expect much appreciation on this property. I purchased this for CASH FLOW purposes only. Rent paid on time. The tenant did however submit a repair request for the AC unit not blowing out cold air. Since the AC unit is less than a year old, the unit was fixed free of charge. Tenants are happy, my PM is happy and I’m happy. Satisfied! This my 2nd turnkey rental property. I do not expect much appreciation on this property. I purchased this for CASH FLOW purposes only. Rent paid on time. No repairs. Satisfied! This is a note that I own from a house that I sold via owner finance. Mortgage paid on time. No issues. If you notice though, the reason why this asset will continue to go down from the spreadsheet above is because it is a note and the principal balance on it goes down each month as the buyer pays me. Remember, I’m the lender on this one. Satisfied! This is my newest rental, just purchased it in early June and I absolutely love this house. I got paid June’s rent payment right after closing and I don’t have to start paying the mortgage on this one until August 1st. So for two months, I get to see extra cash flow on this. Pretty awesome! Obviously no repairs calls on this one and rent was paid on time. Satisfied! I only use one credit card (rewards card) that I use to purchase my everyday expenses. I pay this off in full every month. This number will change each month. I recently started using my other backup credit card to purchase every day items because I received a promotion that the rewards went up to 1.5% cash back on ALL purchase. The card I was using last month only had 1% cash back. So I’m excited to get back a little bit more rewards. Whoo hooo! Satisfied! As you can see below, the big dip is when I put down the down payment on the new rental house I bought in early June. This however quickly went back up after adding the new asset to Personal Capital as well as all the cash income I receive through out the month. If you want to setup and track your net worth online like I do, create a free account Personal Capital . Impressive! If you can grow by 8k per month you will be retired early in no time. Looking forward to see how it goes next month. Thanks for stopping by! Ha, I think im still a very long ways from that point but Im going to try my hardest to speed it up for sure. I dont think Ill be able to grow it by 8k each month and I dont have any other data to compare it with because I only recently started tracking this so I dont know if that is normal or not yet. We’ll see next in the next few months what the average will be. Im actually super curious to find out myself. Clearly an excellent month. Congratulations! While I tend to look strictly at portfolio value – it differs somewhat from net worth in that primary residence, autos, etc. are not part of the calculation – like you, I am a fan of tracking progress each month. Currently my target is a 10k – 12k gain each month. Hey James! I tend to agree with you partly. I dont think an automobile or any kind of vehicle unless its a vintage classic should be used as an asset but I do see other’s including that all the time. To each their own I say! I do think the equity in your primary residence is an asset to include though. 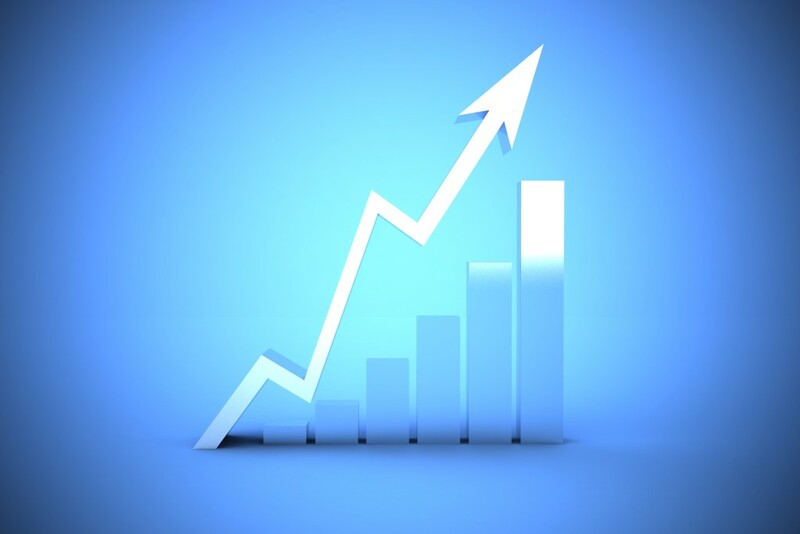 10 – 12k growth per month is great! I hope I can start accumulating that fast in the future and if I keep doing what Im doings, its bound to happen. We include autos in our net worth calculation, but every couple of month I will look up the KBB value and actually take depreciation on our cars. I like have them listed because we might use that value when making decisions about possibly upgrades in the future. For that matter we could always sell one of the vehicles if need be. Well George you are definitely adding them properly by keeping the depreciation accurate based on KBB value. If I did include Autos, that is how I would do it for sure. Really appreciate you coming by and leaving a comment. Thanks so much!! You have a nice rental portfolio building you equity month after month, that’s a great way to build wealth. Thanks so much! Im proud of my rental portfolio but still need to acquire a lot more to build enough passive income to retire! Man, didn’t realize you just started! Makes me want to go and vamp up my blog, haha! I don’t have big plans for my blog, so I’ll just leave it as is for tracking purposes. Congrats on your new blog and wish you much success with your journey! Hey bud! Yeah Im still in my infant stages of blogging but have been investing for years now. 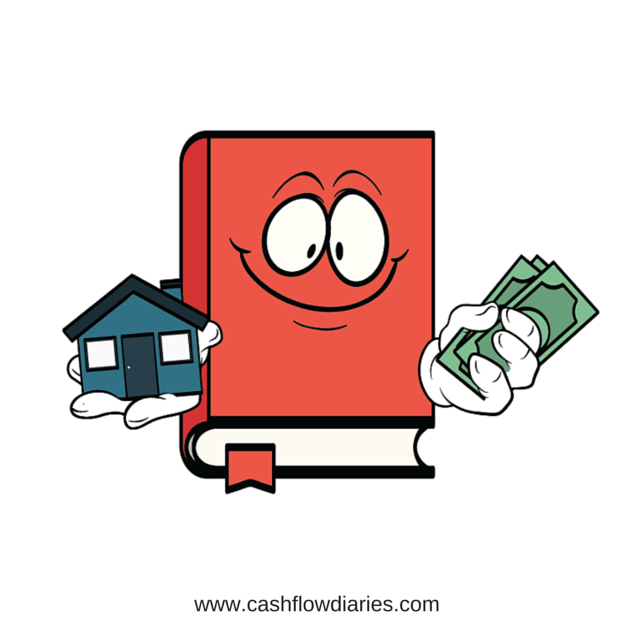 Having the blog for net worth tracking purposes is super useful and that is actually what started Cash Flow Diaries. I really enjoy reading articles like these and congrats on growing your net worth by that much! Have you done any net worth projections? I haven’t tooled around your site enough, but I have recently created a net worth calculator for myself. I’d have to expand it to hold 6 properties but let me know what you think if you find the time to check it out! Hi Erik, Thanks for stopping by, I really enjoy reading other bloggers net worth updates also. I have not done any projections just yet. Ive only just started tracking my net worth and I dont have enough data to be able to accurately project quite yet. I think maybe 6 months from now Ill get a better feel on what the growth looks like and what an accurate projection will look like. I checked out your spreadsheet, its a great idea for sure but I just dont see how it would work with all my rental properties and mortgages. Would have to really modify that thing. Yeah I agree, it is definitely just a start and while I could certainly make it way more dynamic, it would take some more effort. We will see, maybe I will find more time in the coming days to really put some time in. Otherwise, since it is just a rough estimation anyway, you could do a weighted average rate for the interest rate, add up the principals and see if that gives you something meaningful. Financial institutions do it in this fashion when modeling mortgages so I think it could work here. WOW. $8K+ in one month seems amazing to me! Keep up the great work!